Size of this preview: 675 × 599 pixels. Other resolutions: 270 × 240 pixels | 2,723 × 2,417 pixels. Description: Walt Disney shows Disneyland plans to Orange County officials in December 1954. 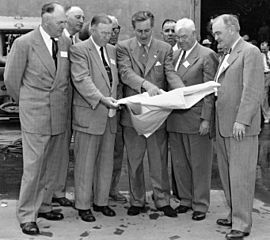 The men in the front row (left to right) are Anaheim Mayor Charles Pearson, Orange County Supervisor Willis Warner, Walt Disney, Supervisor Willard Smith, and Orange County Planning Commission Chairman Dr. W. L. Bigham. The photo was taken at Disney Studios in Burbank. This page was last modified on 19 April 2017, at 19:45.